2. 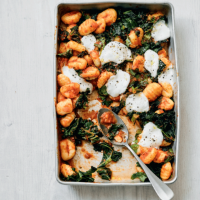 Cook the gnocchi and kale in boiling water for 3 minutes, drain and return to the pan. Add the tomato and basil sauce and heat for 1 minute. Stir in the basil. 3. Transfer to an ovenproof dish and scatter over the mozzarella cherries. Bake for 15 minutes and serve.